BURN CALORIES & RESHAPE YOUR BODY! - Lifting weights and long hours on the treadmill is not the only way to get fit! In fact, Boxaball might be even better and far more compelling. The unpredictability of the ball, coupled with the intensity of your punches will really burn out your arms, chest, shoulders and upper back, perfect for calorie burning and conditioning! WORK OUT ANYWHERE! - Don't have time for the gym? With this boxing reflex ball, you don't have to! Train from home or even from work! It's lightweight and portable, which means you can carry it virtually everywhere with you! No more excuses...simply adjust the headband and you're ready for your daily workout! THE BEST WAY TO IMPROVE YOUR REACTION TIME & SPEED! - You don't have to be a professional boxer to use Boxaball! It's the perfect training equipment that will increase your agility, concentration and reflexes while providing an intense workout! SUITABLE FOR EVERYONE! - Man or woman, teenager or child...it doesn't matter! Everyone can use Boxaball either for training purposes or for a fun game that will build your hand-eye coordination and it will nicely compliment your MMA, boxing or kickboxing training! 100% SATISFACTION OR YOUR MONEY BACK! - Boxaball is truly a professional piece of fitness equipment and we stand behind it 100%. After all, we use it ourselves all the time! That's why we are proud to back it up with our 100% money back guarantee, in case you are not entirely satisfied with it! Looking to improve your boxing skills? How about enhance your coordination, concentration and speed? Maybe also looking for a way to get a nice workout in your day and stay in shape? Whatever the case may be, we have exactly the equipment for you! Presenting Boxaball's Boxing Reflex Ball: Punch Your Way To Greatness! Even professional boxers have used Boxaball to take their game to the next level, increase their awareness and speed. 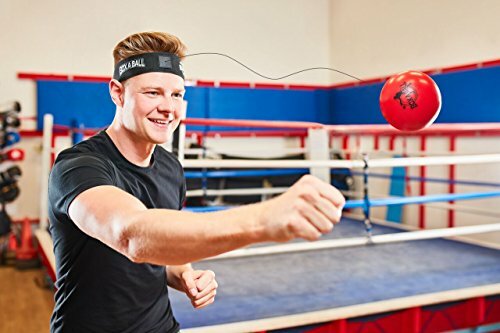 With an adjustable and comfortable headband, all you have to do is wrap it around your head and start punching the ball without letting it hit your face! You can dictate the pace of the ball with the force you use to strike it but the art of BOXABALL is to maintain a rhythm but also counteracting the unpredictability of the ball with your reflexes/fast reaction. If you are new to this, start with slower and less intense punches to avoid hitting yourself in the face. The more you train with it, the better you will become and eventually the results will be truly impressive! Who said working out has to be boring and uninspired? With Boxaball, you can strap the headband on, have fun and burn out your body within 15-20 minutes! Perfect for work breaks or school breaks or even for the beach and the park, this punching ball equipment will definitely burn a lot of calories and help you get fit! Knowing that Boxaball is covered with our FULL money-back guarantee, there is absolutely nothing holding you back from making it yours today and improving your concentration and punch accuracy! Scroll Up And Click 'Add To Cart' NOW!